In the ancient city-state of Gujaareh, peace is the only law. Upon its rooftops and amongst the shadows of its cobbled streets wait the Gatherers - the keepers of this peace. Priests of the dream-goddess, their duty is to harvest the magic of the sleeping mind and use it to heal, soothe...and kill those judged corrupt. I’ve been a fan of Jemisin ever since I read The Hundred Thousand Kingdoms trilogy. The rich world-building, the seamless integration of culture, religion and politics into the plot, the complex—and I do mean complex—characters, and a prose that immerses you from page one, is something I rarely find in today’s fantasy novels. Yet, Jemisin does it flawlessly. 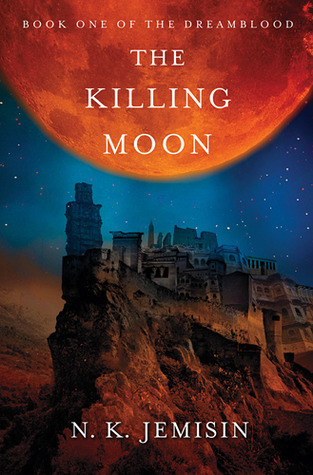 In The Killing Moon, we are transported to Gujaareh, a city loosely based on ancient Egypt complete with camels, a nearby river that brings annual floods, and a desert. The people of Gujaareh worship Hananja, a female goddess of dreams. The Hetawa, an order of priests, maintains the law of Hananja and the peace of the city by using magic to take the dreams of people. Sometimes it’s to ease an old one into the afterlife, and other times it’s to ‘gather’ a corrupt person. Jemisin does a great job of showing the two sides of ‘gathering.’ On the one hand, criminals are dealt with swiftly and without bloodshed, and elders pass comfortably into the afterlife. On the other hand, no everyone wants to pass on even when they’re old and dying and it should be their right to have that choice. After years of faithful service, Ehiru makes a mistake during one of his gathering and discover corruption lies deeply rooted in Gujaareh. Though Ehiru believes he’s no longer worthy of being a Gatherer, there aren’t enough of them for him to take a break. In fact, he’s appointed a new apprentice, Nijiri, who loves him more than life itself. Their relationship is deeper than any title—friends, lovers—could ever signify. Ehiru takes Nijiri on his first gathering, only the woman they were sent to gather reveals a sinister plot. Sunandi, ambassador from a neighboring country, is looking for proof the Hetawa and Gujaareh are corrupt. To say more would be to spoil the plot, so I won't. Just know that once you embark on this journey with Ehiru, Nijiri, and Sunandi you won’t be able to stop. These are characters that pop off the page with their ‘realness’ and you are invested in them from the moment they appear on the page. Even the villains were complex creatures. When villains start to make sense, even though you know they are wrong, the author has done his job well. The book took me a while to finish, not because I wasn’t interested, but because it isn’t a fast read. It’s complex, it is pure high fantasy. Jemisin doesn’t do info dumps either, which means not much is explained in the beginning. You have to read and read carefully, pulling the pieces of the puzzle together. This is why I love Jemisin’s work the most. "I don't doubt your love," she said. "You are a man made for love, I think. Your eyes make me want to die, there's so much love in them. But it isn't real. Real love lasts years. It causes pain, and endured through it." He was too stunned to respond for several breaths. When he finally found his tongue he could barely stammer out words. "That pain comes with love...that I can accept, old mother. I have lost loved one--family. But they died quickly, and I pray thanks to my Goddess every day for that blessing. Are you saying it would hav ebeen better to let them suffer?" She snorted aloud. "Suffering is part of life," she said. "All the parts of life are jumbled up together; you can't separate out just one thing." She patted his hand again, kindly. "I could let you kill me now, lovely man, and have peace and good dreams forever. But who knows what I get instead, if I stay? Maybe time to see a new grandchild. Maybe a good joke that sets me laughing for days. Maybe another handsome young fellow flirting with me." She grinned toothlessly, then let loose another horrible, racking cough. Ehiru steadied her with shaking hands. "I want every moment of my life, pretty man, the painful and the sweet alike. Until the very end. If these are all the memories I get for eternity, I want to take as many of them with me as I can."